Reen, welcome to Scrumptious Street! I am so happy to have you here. Ah, I love the food from Malaysia, I'm honored to have you here. 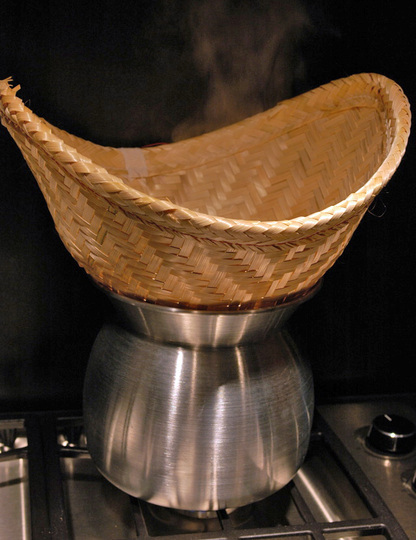 Would love to know more about your coconut sauce -- is it not just more of the syrup here? Sounds decadent. Indeed, it's fattening, so that's why it is often my only dish for that meal or sometimes even that day! This looks SO refreshing and delicious. 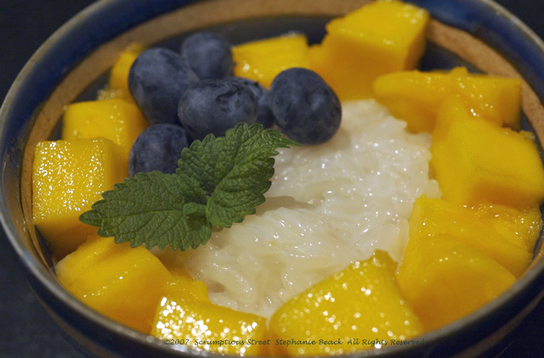 I love sticky rice, and what better than to add mangoes for a summer treat? Great pictures. Thanks, Hillary. Glad you like the photos and this dish really hits the spot on a hot summer day. Hope you try it out! Hey cool, Hillary! Thanks! Sounds like a good time out, but sad to hear your friends didn't care for the sticky rice with mango. At least you did, so one out of three isn't too bad. Oh well, we're all different! I noticed your link to my post is broken, try using the "Permalink" on this entry. Cheers!